Imagine an army of self-replicating robots, each invisibly small, endlessly reproducing, forming a grey mass that swamps the world, and destroys its resources. 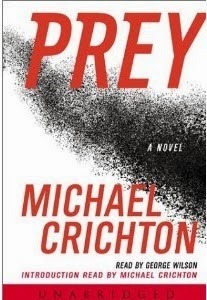 This was the premise of Michael Crichton’s thriller, Prey, but the concept of using invisibly small technology is not just science fiction. This so-called ‘grey goo’ scenario is fantasy (grey goo because the nanobots are too small to be seen individually, and would collectively appear as a viscous, self-moving grey liquid). But nanotechnology is real and has a huge potential. Until recently, that prefix ‘nano’ was an unfamiliar one. At the 11th Conférence Générale des Poids es Mesures in 1960 a faceless committee defined the SI (Système International) units. As well as agreeing standards of measurement like the meter, the kilogram and the second, the conference developed a range of prefixes for bigger and smaller units from tera (multiply by 1,000,000,000,000) to pico (divide by 1,000,000,000,000). The penultimate prefix was nano, (divide by 1,000,000,000), derived from nanos, the Greek word for a dwarf. One billionth, a truly tiny scale. 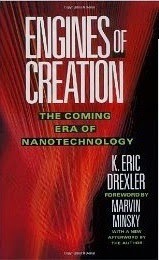 Twenty-six years later, American author K. Eric Drexler combined “nano” with “technology” in his book Engines of Creation. Although Drexler outlined a wide range of possibilities for products smaller than a microbe, the majority of the book focuses on molecular manufacturing, using nanomachines to assemble objects at the molecular level, a concept first suggested by physicist Richard Feynman. A single assembler working at this scale would take thousands of years to achieve anything –assembly would require trillions of nanomachines. Drexler speculated that this would require nanomachines that could replicate like a biological creature, leading to the vision of grey goo and Crichton’s Prey. Real nanotechnology does not involve anything so complex as an assembler. 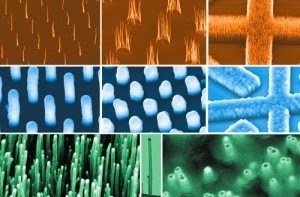 One very limited form of nanotechnology is already widely used – nanoparticles. Substances reduced to particles on this scale have a very different physical behaviour to normal materials. The most common use of nanotechnology currently is sunscreens, where nanoparticles of zinc oxide or titanium dioxide are used to protect us from the sun’s rays, allowing visible light to pass through, but blocking harmful ultraviolet. In fact we have used nanoparticles unwittingly for centuries in some of the pigments used in pottery glazing. A more recent development is to use nanotechnology in the form of films of material that are around a nanometre in thickness. We’ve seen this in the lab with graphene, the amazing new form of carbon developed at the University of Manchester, which looks to have huge potential, but nano-coatings are already employed in the real world, protecting everything from mobile phones to footwear from liquids. A little further down the line are nanotubes and fibres. Often made of carbon, these molecular filaments are grown rather than constructed and have the capability both to provide super-strong materials (as an extension of the current cruder carbon fibres) and incredibly thin conductors for future generations of electronics. Semi-conducting nanotubes have already been built into (otherwise) impossibly small transistors, while carbon nanotubes could make one of the more remarkable speculations of science fiction a reality. 2002: “[With nanotubes] I’m convinced that the space elevator is practical and doable. In 12 years, we could be launching tons of payload every three days, at just a little over a couple hundred dollars a pound.” Clearly his timescales were way out – but the concept is still amazing. Today’s practical applications of nanotechnology derive largely from the special properties of small assemblies of atoms, but nanotechnology has one other incredible trick up its sleeve: quantum theory. At the scale of an atom, physics operates by rules that are entirely different to the familiar world. The counter-intuitive nature of quantum behaviour, from single particle interference to tunnelling opens up new possibilities for the technology of the very small. Perhaps the best example of nanotechnology showing the promise of quantum effects is plasmonics. Something remarkable happens if, for example, light is shone on a gold foil peppered with millions of nanoholes. It seems reasonable that only a tiny fraction of the light hitting the foil would pass through these negligible punctures, but in fact they act like funnels, channelling all the light that hits the foil through the sub-microscopic apertures. This bizarre phenomenon results from the interaction between the light and plasmons, waves in the two dimensional ocean of electrons in the metal. The potential applications of plasmonics are dramatic. Not only the more obvious optical ones – perfect lenses and superfast computers that use light (photonics) rather than electrons to function – but also in the medical sphere to support diagnostics, by detecting particular molecules, and in drug delivery. Naomi Halas of Rice University in Texas envisions implanting tiny cylinders containing billions of plasmonic spheres, each carrying a minuscule dose of insulin. Infra red light, shone from outside the body, could trigger an exact release of the required dose. ‘Basically, people could wear a pancreas on their arm,’ said Halas. Nanotechnology may be scary in fiction, but away from the mythology it has an awful lot to offer.